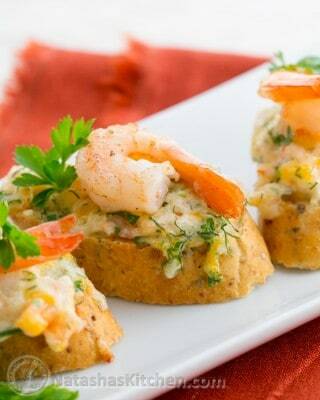 These cheesy shrimp canapés were super easy to make and uber delicious. You can't go wrong with this list of ingredients! I invited my sisters and their families over for dinner this past Sunday and they were all raving about these fantastic little tea sandwiches. You'll want to pin these for future reference! My husband's cousin, Angelina shared this recipe with us for her "shrimp sandwiches." Thanks Angelina for another great recipe. New favorite for sure! P.S. Angelina is also the genius behind: 1. Easy bread kvas 2. Braised cabbage with beef 3. Canned Veggie Assortment I am so blessed to know some fabulous cooks! Thanks so much for sharing! Rinse the cooked shrimp and pat dry with paper towels. Peel shrimp and coarsely chop into small peaces. Transfer shrimp to a medium bowl. Chop parsley and dill, mince garlic and transfer to the mixing bowl. Add in the rest of your spread ingredients: 1 cup cheese, 1/2 cup mayo. Stir it all together and you have your spread. Cut your bread into 1/2-inch slices. Spread the mixture generously over the bread slices, place it in the oven at 350˚F to melt the cheese and sizzle the shrimp a tad (8-10 minutes).